Atmospheric rivers are frequent and mostly welcome; they account for most of the rain that falls in California every year. Only when an AR stalls do you have “the most serious risk,” Ralph says. In the winter of 1862, a stalled AR system pounded the Western U.S. with rain, snow and high winds for 43 days, causing flooding everywhere from Southern California to Utah (see HCN, “The Other Big One,” 2/15/2010). More recently, in early January 2005, 20 inches of rain fell on Southern California, causing a mudslide in Ventura County that killed 10 people and buried 15 homes in the tiny seaside village of La Conchita. So Stock and his team installed sensors on Bay Area hillsides to measure different kinds of water pressure. One set measures “negative” pressure, which Stock describes as the water that soaks into the pores of a sponge. The other set measures “positive” water pressure — the water that drips out after the sponge is full. 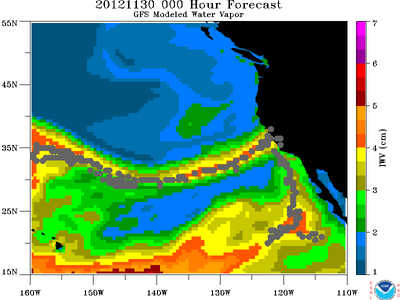 Last week’s atmospheric river certainly wasn’t the worst of what could happen. “Thankfully each of the storms moved through fairly quickly,” Ralph says, “so the rivers had time to recede.” But it wasn’t trivial, either. A classic “Pineapple Express” type AR, it brought as much as two feet of rain and 45 inches of snow to parts of Oregon and California. As the scenario unfolded, Stock wondered whether to issue a warning. Disaster preparedness is a game of probabilities, of persuading people to prepare for an event that may never happen in anyone’s lifetime, if at all. And so forecasters try to avoid “false positives,” as Stock calls them, that dilute the power of the next alarm. Before issuing a landslide watch, “We wanted to be a position where we created a data set where we had as few false positives as possible,” he says. By Friday morning, however, “the data that was coming in from our sensors suggested that there was a potential for high positive water-pressure spikes,” Stock says, which could cause mud to give way. He called Dale Cox, the Regional Hazards Coordinator for USGS, who put together a “Storm Call” with Stock’s landslide team, plus water and weather experts from the National Weather Service and elsewhere. By Saturday afternoon, the team had carefully crafted a Special Weather Statement for Cox to hand off to the weather service — just before the third and largest wave of the AR was to hit. The statement warned of a potential for landslides. It was one of those times “where the mission to save lives and property conflict with the needed cautiousness required to produce sound science,” Cox says. By Monday, the last dregs of the atmospheric river were passing through California, dispensing only a light drizzle along the coast. Late in the day, a startling blue sky broke through for the first time in five days. The hillsides above and around San Francisco had stayed put, and the cautiously issued watch became the project’s first false positive. It was not, however, a wasted opportunity. “We learned a lot,” Stock says, “about how to interpret our instrumentation better so we can make better assessments in the future.” By the time the next atmospheric river flows ashore, “we’ll be in a better position to avoid false positives,” he hopes — and, just as important, false negatives. “We’re still learning the lessons about how to use our system to develop an effective warning system,” he says. With luck, the funding will hold out to learn more. Like all government employees, Stock is worried about the next potential catastrophe, this one political: The cuts that could come with sequestration. Judith Lewis Mernit is a contributing editor at High Country News. 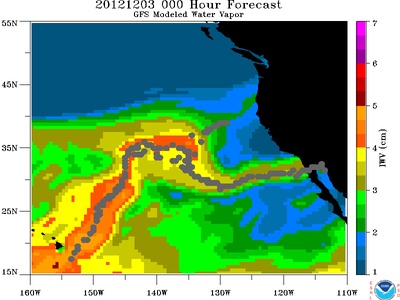 Images of atmospheric rivers, from November 30 and Dec. 3, (find more cool ones here) courtesy the Earth System Resource Library at NOAA.